Over time, grime and residue starts to build on your siding, patio, or roof. It’s just a natural part of being constantly exposed to the outdoor elements. The good thing is that you don’t have to stand for this grime and residue. It can be removed, and the best way to remove it is by power washing. While you can certainly try power washing on your own, you’ll see the best results by bringing in a commercial power washer. But how do you ensure that you’re hiring a legitimate power washing company? Here are 5 questions to ask when hiring a commercial power washer. 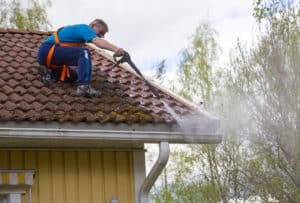 The very first thing you need to know about a power washing company is whether or not it and its employees have secured the proper insurances. If a company that you use is not insured, you could be on the hook not only for damage done to your property but for injuries that occur to workers on your property as well. Just make sure that the company you hire is legally responsible for both damage to your property and the health of its employees. While it’s not true in all states, in many states, official licensure is required for commercial power washers to do business. Even if it’s not required by the state, it’s still wise to choose a power washer that is licensed. Licensure essentially ensures that the company knows what it’s doing and that it will do at least a decent job. Typical licensure includes occupational licensure and environmental permits. Paying money for something without having any idea of how it could benefit you is a mistake. For this reason, you need to ask for pictures of a company’s work. This will help you determine whether or not the company will be able to get your job done in a sufficient manner. The best way to gauge a power washer’s abilities is by looking at before and after pictures of properties they’ve cleaned. Power washing companies use all different types of processes and chemicals to clean. You need to ask about a company’s washing process to know whether or not it will be safe for your property. Typically, the lower water pressure that a company uses, the safer your property will be. Of course, you still want to make sure that they’ve got what it takes to get the job done. The last thing you want after you’ve had your property power washed is to be surprised with an extravagant bill. Make sure to ask all power washing companies for a monetary estimate of their services before going through with the job. If you can, secure a guarantee which states that costs won’t exceed a certain number. This will ensure that you stay within your budget. If you live in the Nashville area, and are looking for a commercial power washer to clean your siding, patio, or otherwise, Pro Wash has you covered. Our team of seasoned cleaners is well-versed in providing a safe, effective, and professional power washing experience. Get clean by contacting us today!